61 Legian is located on Legian street, and it is called Sky Garden. 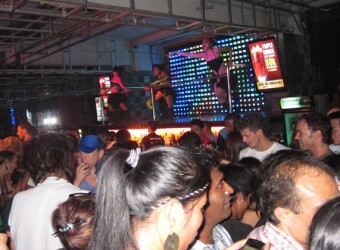 It is a fashionable club comparing with other night clubs around there, and mainly foreign tourists enjoy dancing. It also has safer atmosphere than Bounty or Engine Room. Check kinds of music that is different from each floor. I joined night club tour and went to a night club in Bali for the first time. Although other night clubs in Legian was only a few of guests, however the famous Sky Garden was crowded. The belongings were checked by security staff before get into the night club. There were many Westerners in this night club. It was liven up from midnight. I went to the night club with my zippered bag but when I noticed it was fully opened! !Nothing was stolen but when you go to a night club you must guard your belongings well. But it was really fun! !